Keri’s scream woke her from the nightmare…that huge black SUV bearing down on her, crunching her leg against the concrete barrier in the zoo’s parking lot. An unlikely hero, the elephant in the zoo where Keri works, saves her from sudden death. If the animals didn’t make such an uproar, the SUV would have come at her again… and killed her. But now, who will save her in the real world? The police investigate fruitlessly. The threats keep coming. Eventually, Kevin has to move back into the house with her and the kids while her leg heals—and also for her security. Is Kevin enough to stave off a killer? The kids love having them all together again, but she,,,? She feels the same old pull when he looks at her, and when he touches her. But is that enough to open her heart again? And for what? Another heartbreaking separation? 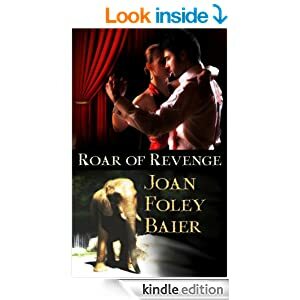 This novella, Roar of Revenge, is a quick read and answers all these questions in a suspenseful romance of intrigue, mystery and love.